Q1. 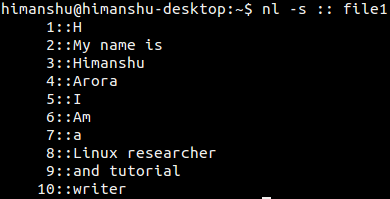 How to use nl command? Q2. How to number empty lines? Q3. How to customize the number increment value? Q4. How to make nl consider multiple empty lines as one? Q5. How to use different numbering formats? Q6.How to use a customized numbering separator? Q7. How to make nl use a different starting line number? 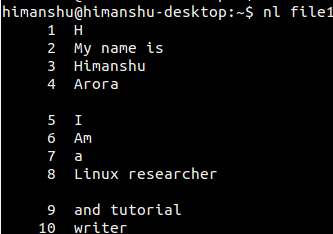 Linux offers a lot of text formatting command line tools, with each of them having a different purpose. 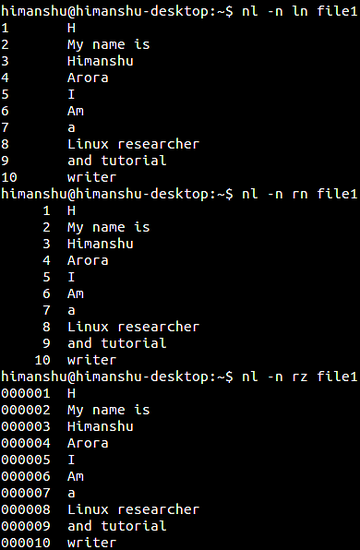 One such utility is nl, which lets you number lines in files. In this tutorial, we will discuss the basics of this command using some easy to understand examples. 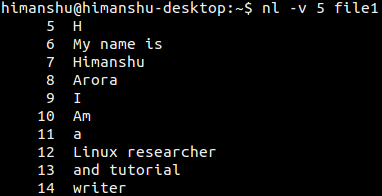 But before we do that, it's worth mentioning that all examples used in this tutorial have been tested on an Ubuntu 16.04 LTS system. Following are some Q&A styled examples that should give you a better idea on how nl works. 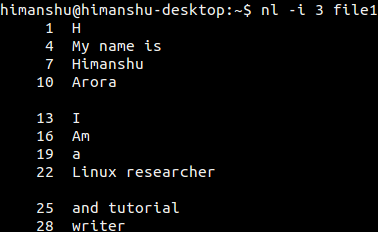 Basic usage of nl is very easy - all you have to do is to pass as argument the name of the file whose lines you want to number. 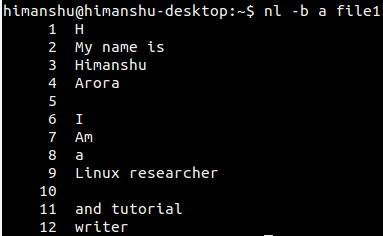 However, if you want, you can change this behavior by passing value 'a' to the -b command line option. By default, the number increment value is 1. 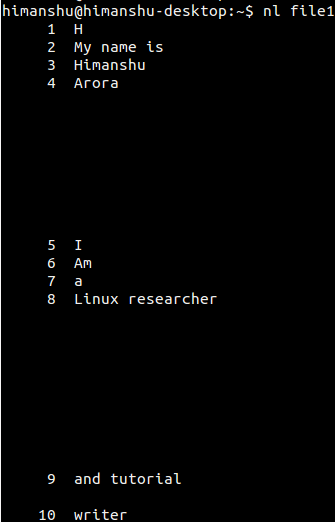 However, you can customize this using the -i command line option. You can use the -n command line option to specify numbering formats. Available option include left justified, right justified, and right justified with leading zeros. You can access these using the ln, rn, and rz values. By default, the character that separates number from the line is a TAB. 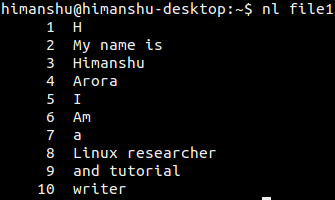 However, if you want, you can customize this using the -s command line option, which requires the new separator as input. The nl command is easy to understand and use. 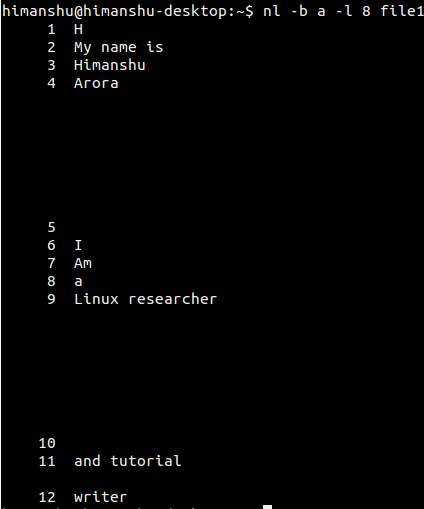 Here, in this tutorial, we've covered majority of the command line options it offers. Once you are done practicing these, head to the tool's man page to learn more. Hi I would like to ask about rz value. Why there even are zero's there? What's the point of that? I mean, where they came from? Asking because my teacher asked for this to find out why and I can't find the answer anywhere. Thank you in advance.